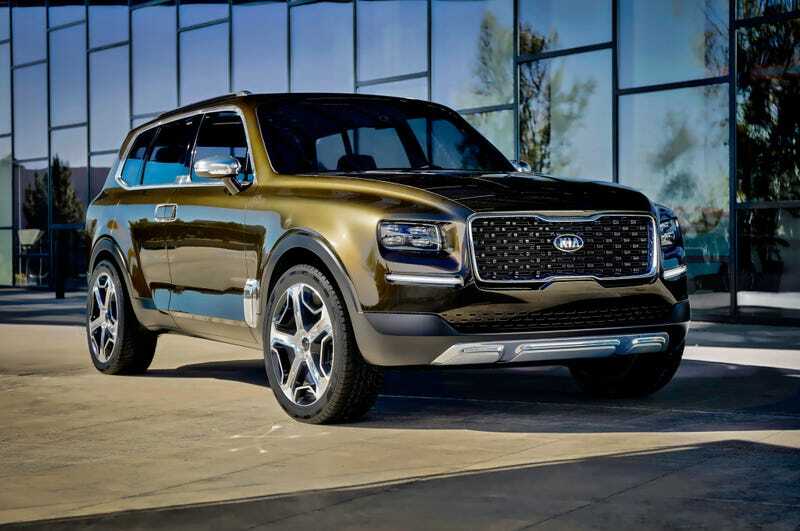 Kia Telluride heading to production: Motor Trend reports that the handsome Telluride concept from 2016 is heading to production. Handsome and square, it has 3 rows and will slot above the Sorrento. Borrego redux? Speaking of Kia, a diesel Sorento is coming: Car & Driver is reporting that Kia is bringing a diesel Sorento to market by the end of 2018. They are predicting that it will be the 2.2-liter turbo diesel inline-four that the Sorento gets in Europe. That engine makes 197 horses and a healthy as hell 325 ft/lbs of torque. A 3 row Alfa SUV is coming before 2022. He also stated that not further developing Alfa and Maserati would be “financially suicidal” for FCA. A Pacifica based crossover is finally coming with him saying they can get it up and running within 18 months. Ferrari’s SUV is coming at the end of 19' or early 20'. The Wrangler pickup is coming late 2019. No more building Jeeps in Mexico. Apparently hes given up on a merger and doesnt think it will happen, and if it did it wont happen while hes there. His successor is going to be named soon. One name mentioned to take over for him is the ironically named Mike Manley who is over Jeep and Ram. For 2018 the Kia Soul EV gets a range boost: To 111 miles thanks to a boost in capacity in its battery pack. An X3 diesel and M model are coming: Both will be built at the South Carolina plant. No word on the diesel specifics yet, but the “X3M” has been seen testing and it would only make sense seeing as there is a GLC63 AMG.